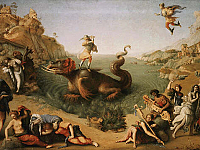 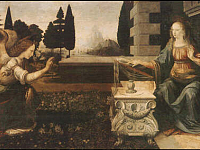 Leonardo da Vinci, the genius, not only was a great scientist and inventor, he also was a refined artist. 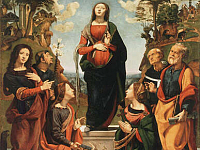 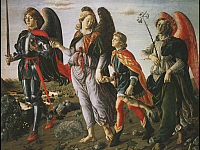 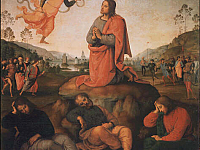 One of the very first works showing the ability of Leonardo as a painter is the Baptism of Christ painted by both Verrocchio and Leonardo, Leonardo painted the kneeling angel by profile on the right side of the painting (your left, when facing it) and probably some parts of the landscape. 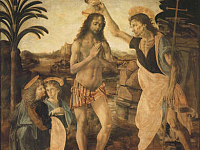 Just compare that angel to the figure of Saint John the Baptist and you will soon perceive the delicacy and sweet grace typical of Leonardo's style. 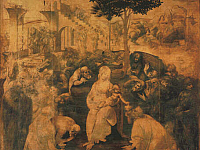 The room also houses the wonderful Annonciation by Leonardo. 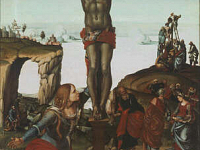 It is amazing the fact that, even if it is hard to believe, this is a work where art and science perfectly coexist. 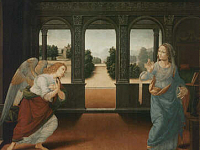 In addition to the works by Leonardo, some other paintings are visible in this room, all belonging to the last part of the 15th century. 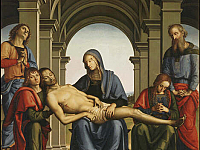 Among others, some works by Pietro Perugino like, for instance, the Pietà, a painting showing an intense sense of mysticism, easily recognizable in all Perugino's paintings.